Clarins e-Gift Certificates can be ordered in any amount starting at 5$. They are sent, via e-mail, to any individual with a valid e-mail address. 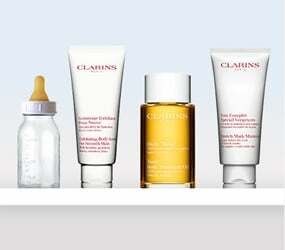 The recipient of an e-Gift Certificate will receive an e-mail with a redeemable promotional code to be used only at www.Clarins.com. The code will be activated within 24 hours after receiving the e-mail. 2) An e-mail confirming that a Clarins E-Gift Certificate has been sent by you, will be sent to the person for whom you've made the purchase. E-Gift Certificates are activated and ready to use as soon as the recipient registers and logs in as an account member and validates his or her certificate number.